Amazing DJ Experience: The Best of the Best!! Jeff and Amy Baker are AMAZING! They exceeded our expectations and made everything flawless and seamless on our wedding day! My husband and I were married the day after Thanksgiving, and Jeff and Amy came to our rehearsal dinner (on Thanksgiving!) and did a phenomenal job in directing and making sure we understood all the logistics and procedures of the wedding day. On the actual day, I can't say enough about how professional, prompt and detail oriented they were. They made everything run so smoothly and efficiently. It was wonderful working with a husband and wife team. Jeff did all the announcing and "DJ" ing, for lack of a better term, and Amy was in charge of all the logistics, making sure we were where we were supposed to be, making sure we didn't need anything, and heading up all the details! And they were so fun! Our dance floor was full all evening! Amy even helped my mom and sister with my complicated dress bustle! I would recommend them without a doubt- I have no doubt they will exceed your expectations as well! We were honored to have them be a part of our wedding day! I have to say I am so thankful to have had Jeff and Amy apart of my wedding! They were on top of things, had the crowd happy and into it, great communication between them and my husband and I, and most important such wonderful people that really do care about your special day!! I told my husband we need to plan another event and have them come back out again because everyone loved them!! I still have people talk about them and they loved them. I would HIGHLY recommend them to anyone!! You will not be disappointed!! Jeff and Amy are WONDERFUL! We got married last weekend and our guests are still raving about the DJ. Jeff and Amy were kind enough to drive to our venue two months before the wedding to walk around and go over all of the details with us, including pronunciations for all of the names in our wedding party. We knew from that moment that we had made a great decision by choosing them to help us celebrate our big day. On the wedding day, we didn't see them move their stuff in at all, but we didn't worry for one second. They were so smooth and efficient and totally ready for us when it was time for the reception to begin. Amy coordinated everything, from getting our wedding party lined up to teaching our speakers how to hold a mic. Amy and Jeff are like a two-for-one package and they work so well together. They are effective without being intrusive - it's amazing how they can do their job so perfectly and keep everything in line but you still barely notice they're there. The music kept our friends on the dance floor all night and we couldn't have asked for a better party. We loved the special touches like the Married Couples' Dance and Jeff handled all the details like announcing our hashtag and shuttle bus system. Jeff and Amy are the absolute BEST and I would never pick another DJ for a special event. Do yourself a favor and hire them - they will make sure your day is perfect. I have so many wonderful things to say about Jeff & Amy. They are not your run of the mill, side job DJ company, these two are true professionals. Jeff knows what songs to play and when play them. They kept young and older people dancing together the entire evening with perfect song choices. Amy keeps things flowing with bridal party introductions and evening events flawlessly and I don’t think I ever saw her without a smile on her face. A great DJ is such an important part of a wedding and with Let the Good Times Roll, you are getting the absolute best in the business! They are an epic team! Jeff and Amy were fantastic to work with! Their planning and professionalism made our reception seamless. Our guests had a great time on the dance floor and Jeff did a great job keeping everyone engaged! Amy captured great photos throughout the evening and kept everyone on track. We enjoyed working with Jeff and Amy very much! Cannot recommend Let the Good Times Roll and Jeff & Amy Baker enough! Jeff and his wife made our day so special. One of our goals was for everyone to have a fun night on the dance floor and that's just what happened! So many DJs in the area are younger and not very professional and can even make the wedding-feel a little inappropriate or uncomfortable, but Jeff and Amy made it fun for every guest of every age. So many people came up to me saying that they had never been to a wedding where everyone was dancing and singing every song at the top of their lungs. From start to finish, they made this day so easy and fun for us. I would recommend them every time! So happy to have had Jeff and Amy provide the music at our wedding reception! Amy was wonderful by keeping things on track and helping anyway she could (she even knows how to do a bustle!) Jeff provided excellent music and keeps the crowd excited! Would definitely use again for another event! We got married this past weekend and Jeff and Amy were AMAZING to work with! From the moment we contacted them about their rates and services until our wedding reception, they provided excellent customer service. Even when we met with them in-person a month before the wedding to make sure we were all on the same page, you could tell they were friendly, professional and detail-oriented, taking notes about everything we talked about. Amy helped line up the bridal party for introductions, kept us updated on the evening's events while still making sure we didn't stress about the time and enjoyed ourselves, and kept the vibe of the night fun and upbeat with music. We had no doubt we picked the right DJ for our wedding reception and they exceeded our expectations! Jeff and Amy are the absolute best in the business. Made the entire night run smooth and all of our guests had a blast. They are extremely professional when contacting prior to the event, very detail-oriented and experienced! We just got married last weekend and Jeff and Amy were amazing! They came to the rehearsal dinner and helped us figure out the ceremony. They even played the ceremony music while we were practicing to make it more realistic. On the day of, they helped us lining us and even worked with us when we had to delay the ceremony by a couple of minutes to allow last minute guests to show up. All of the music and games were so much fun! We had all ages on the floor dancing their butts off! We would absolutely recommend them to anyone! Jeff and Amy were so amazing during our big day!! They are the quite the duo, and have their services down pat. We were extremely happy with Jeff and Amy. They held a pre-wedding consultation with us months ahead of time so we could meet them, and talk a little more about our needs from them. They were open to our ideas but also brought some songs to the table that we had not thought of. They worked so well with us to make sure the music for our big day was amazing. They were great to work with from the first meeting to the big day. They were familiar with our venue and the staff, so they came to our rehearsal and made it run so smoothly. To us, they went above and beyond what was expected. Our guests could not say enough about the music, from the ceremony to the dinner music, to the fun dancing at the end of the night. Jeff and Amy kept everyone going and entertained through the close of the reception. Honestly, we couldn’t say enough about these two and the great services they provide for weddings! Jeff and Amy were amazing to work with. My wife Katie and I had them DJ our wedding and we received many compliments about them and their services. They played a great array of music, getting all of our guests from age 1 to 93 out on the dance floor! They made the night run smoothly and perfectly. We highly recommend them! This is the best DJ service ever!! Out of everything that we put into our wedding the DJ was the best spent money. They are worth every penny if not more. Both Jeff and his wife were more than outstanding to work with. They are very organized, they keep everything flowing on our wedding day. With 300 wedding guest I was nervous about how they would keep the day going with that many people there, but they did it without a problem. They kept everyone on the dance floor until the very end. 5 Stars!!!! Priscilla, thank you so much for your kind words. It was an honor and a privilege to work with such a wonderful couple. My wife Amy and I wish you both all the very best and appreciate you obtaining our professional disc jockey services for your beautiful ceremony and high energy reception. Would highly recommend them! They gave us exactly what we wanted and more. They were so great to work with. Jeff and Amy were incredibly helpful during our ceremony and reception. They kept everything moving on schedule and made sure every detail was covered before hand. We highly recommend Let the Good Times Roll! Jeff and Amy were great to work! The service they provided was amazing and I had so many guests say how they had so much fun. I would recommend them to anyone. Jeff and Amy were a blast to work with! They were super easy going and accommodating; especially for a couple like ourselves that were planning a WV wedding from GA! They were excellent in getting all of my family on the dance floor and all of our guests really enjoyed the entertainment! 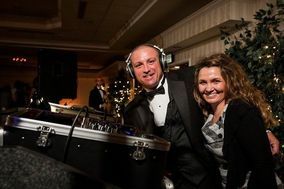 DJ Jeff Baker and his wife, Amy, are the absolute best choice for wedding day entertainment. The are priced competitively but provide personalized service that you dont receive from other DJs. I felt completely at ease knowing they were taking care of our ceremony and reception music. They made sure the flow of our day was smooth and it couldnt have been more perfect. Jeff and Amy Baker's service is outstanding! From the first meeting that I had with both of them, I knew that by choosing them to provide the DJ services at my wedding, that all would go smoothly. Jeff is extremely responsive, and will ensure he has everything PERFECT for your special day. Amy was great at coordinating the wedding to also ensure that all is on time and organized. This dynamic duo really know what they’re doing, and I would totally recommend them to anyone who wants a smooth, organized fun party! Their professionalism and organizational skills make them a great team, and have also made their business reputable and continue to impress at every event. Excellent services. Kept things moving along smoothly and had everybody organized and in place when and where they needed to be. Above and beyond the services expected of a DJ. Jeff and Amy did a fabulous job at our reception. They coordianated and announced all parts of the reception. They took time prior to the day to go over all music choices, names of our attendents, progression of the evening, and were able to give thoughtful advice, which we found extremely useful! They were very professional in appearace and with all of our guests. They had everyone dancing so much, that we asked them to stay 1 more hour so that our guests could continue the good time!! Amy and Jeff included all of the children by coordinating a fun activity on the dance floor which gave their parents time to enjoy their dinners! The kids and adults had a blast!! We would recommed 'Let the good times roll DJ service' to anyone planning a special occassion! !